George had made his mind up that the dog would have to go. There was no question about it. It was either Paddy or him. All he had to do was pluck up the courage to tell her. It wasn’t as if they needed the damn thing. Yes, they were in the countryside but this wasn’t the Wild West and packs of wolves would not be attacking their small homestead in the night. He would just let it out gently and that would be that. Mind you, it had disappeared into the night again and had shown no sign of returning. He swallowed his whiskey and smiled. That’s when he heard the scratching, announcing it’s return. He grimaced. George rose hesitantly, unlocked the door and stared at the bedraggled dog, it’s face resting on the doorstep. The dog bounded past him, lept in front of his wife and dropped the bundle at her feet. ‘Oh my God, what on earth is that?’ she screamed. ‘Looks like a rabbit to me,’ said George. George bent forward, turned the creature over and smiled. Susan’s face turned ashen white. She staggered backwards and collapsed in the armchair. George picked up the rabbit, turned it over and inspected it. ‘Looks like it ‘s curtains for old Paddy here,’ smirked George. ‘Say we found it. Say it was a fox,’ said Susan. George placed the rabbit on the table, poured himself a whisky and sat down. She could see him smirking. ‘Then bloody well do something!’ she screamed. George gulped down his drink and stared at its mournful eyes. Susan rose, took the rabbit and turned it over in her hands. ‘Must have died of fright,’ said George. ‘Suppose we cleaned him up,’ she said. ‘Don’t be so ridiculous!’ he answered. ‘ Go upstairs and fill the bath,’ she said. Susan raised her arm and pointed towards the stairs. George rose, shook his head and moved slowly up the stairs muttering to himself. Susan picked up the limp body and followed, clutching it to her breasts. She entered the bathroom and lowered the rabbit into the water, holding it by his paws. She kept its head out of the water, almost like a baby and flicked the water gently across its fur. She poured the brown liquid over its body, flicked on more water and gradually massaged it into a huge froth-like ball. ’God, you’re morbid,’ he said. She dipped the rabbit under the water again and again and washed off the outer layer of shampoo until its fur was shiny and white. She directed the fine jets at its body moving it methodically from left to right, spraying off the last layers of froth. He removed one from the cupboard and stretched it out on the floor. She gently lifted the rabbit from the bath, clutched it by its front paws and shook it. The rabbit hung there suspended in space like a huge piece of candyfloss with the final remnants of water dripping from its tail. She placed it on the towel, folded it gently around it and lifted it onto his shoulder like a small baby. They moved to the bedroom. She placed the bundle in the centre of the bed, knelt down beside it and began rubbing it. After a few minutes she was finished and sat back admiring her work. ‘Won’t fool anyone,’ said George sarcastically. ‘Old Endeshaw feeds it every morning and even if it had died naturally, it wouldn’t look like that. And it certainly wouldn’t stink of shampoo. ‘Wait will you, I’m thinking,’ said Susan. ‘Why don’t we just be honest? Let’s just tell the truth,’ said George. ‘Give me that?’ she snapped. George plugged it in and handed it to her. She switched it onto maximum heat and directed the warm hair at the rabbit’s fur. He slapped it into her hand. Carefully and in long sweeps, she dried each segment of fur, twisting her wrist as she reached the ends almost like a hairdresser. She worked meticulously for half an hour, turning the rabbit over and over again until it took on a buffon- like appearance. ‘Oh, very fetching. What are you trying to do? Convert Fluffy into a Dolly Parton lookalike?’ said George. ‘You’ll have to help me finish,’ she said. She placed the rabbit’s paws in his hands, allowing it to swing in mid-air. She redirected the warm air at the rabbit, deliberately puffing out its fur. George held on tightly as the poor animal swung from side to side. ‘Not bad, eh?’ said Susan, placing the dryer on the bed and admiring her work. She took the rabbit from him, placed it in her arms and moved downstairs to the kitchen. He returned clutching a small bundle of brown, dirty straw. ‘Give it here,’ she snapped. 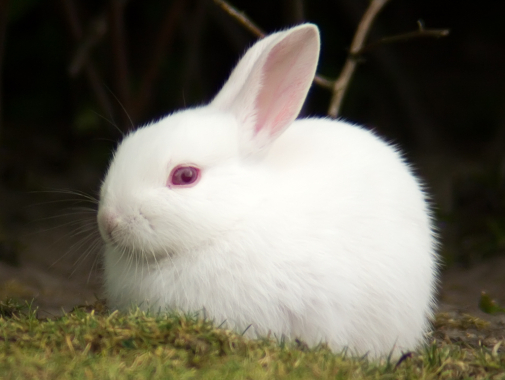 She picked up the rabbit and moved it from side to side rhythmically until the fine white fur was covered in a thin brown layer. They sat on opposite sides of the table, staring at the white, fluffy corpse that lay there like some delicacy at a medieval banquet. At 10.15, she rose. ’Cometh the hour, cometh the man,’ said Susan, picking up the rabbit and placing it in his arms. George tried to protest but before he knew it, he was outside with Susan opening the back gate. ‘Endeshaw always goes to the pub at this time so you’ll be just fine.’ She pushed him out and closed the gate behind him. George lifted the rabbit over his shoulder and moved silently down the garden. He climbed over the fence and moved out into the field at the back of the house. His nerves were on edge, fearful that someone might catch him. What would they think? Was he involved in some satanic ritual or was he secretly plotting on behalf of one of Endeshaw’s rivals at the county fair. He traced the line of houses and eventually came to a tiny thatched cottage, where Endeshaw lived alone. He approached the garden wall and peered over. The living room lights were on, but fortunately the curtains had been drawn. He nevertheless knew he was safe since Endeshaw’s visits to the pub were as regular as clockwork. He placed the rabbit on top of the stone wall and clambered over. Fortunately, it was a full moon and he felt his way to the large wooden shed with it metal grill. He peered inside, catching the faint outline of the other rabbits asleep in the corner. He moved his hand to the latch, twisted it and pulled the bar to one side. He took the rabbit from the wall and placed it in the opposite corner cleaning up the debris on the floor and placing it in a plastic bag. Soon he was home and slumped in the kitchen exhausted. Over the next few days, they waited anxiously for the telltale knock on the door. Each time the doorbell rang or they heard the latch click on the garden gate, they would jump up and stand rigid, staring at each other. Would it be Endeshaw in a wild rage? Would the police be called and poor Paddy led of to a certain death? Or would he resort to violence? After all, Endeshaw was renowned for his skill with a shotgun. But the knock never came. They became reclusive, avoiding the village pub and shops and only venturing out when necessary. They shopped in the next town and busied themselves with all manner of household chores. She even took time off from work, claiming sickness. A month of solitude took its toll and he eventually confronted her. ‘To the local. That’s where he drinks, doesn’t he? ‘If we go on like this, Paddy won’t be the first to go,’ he snarled. They walked nervously towards the small thatched pub adjoining the village church. It was getting towards 10.30 and they knew that Endeshaw would be tucked into his favourite corner surrounded by his farming cronies. They entered and moved towards the bar. They gulped down their drinks, relaxing a little as the warm, brown liquid seeped down to their stomachs. They were just raising their glasses, when they heard the telltale laugh of Endeshaw. For a small, squat man he had an unusual high-pitched laugh, a bit like a cockatoo. Endeshaw rose and moved slowly towards the bar, his tankard in his hand. He was somewhat drunk and swayed from side to side. He moved towards them and slammed his tankard on the bar. He turned and looked them. ‘Yes, well you see,’ said George. ’No,’ he said, wrapping his arms around both their shoulders and whispering. ’Yes, I mean no,’ stuttered Susan. They stared at him in disbelief. He stopped and slurped down his drink. George and Susan stared at him horror-struck. ‘Well, some bugger digs it up an puts it back int’ cage.